In recent weeks a couple of conservative media outlets have begun tallying the number of violent incidents committed by Leftists against Trump supporters. Breitbart News is keeping a running tally of those incidents. Now just a few weeks old, the number has grown from a couple hundred incidents to over 500 now (and counting). 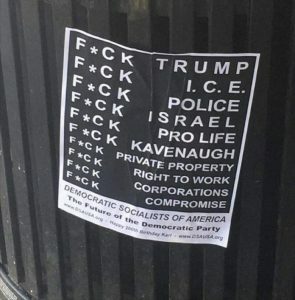 This Democratic Socialists of America poster found in New York City says it all: As one observer noted recently, “Sure, not all Democrats are Antifas, but all Antifas are undoubtedly Democrats” — or, at least, what the Democratic Party is devolving into: A mob-supporting collection of anarchists and revolutionaries who are bent on destroying the civil society because they believe they can somehow make the world a better place if they accomplish their objective. This shift towards chaos and violence, which is unique to the Trump era, by the Democratic Left is going to be problematic going forward, especially if they take Congress in 2018 or the White House in 2020. By then, any remaining vestiges of civility will be long gone. We know this not simply because of the violence we’ve been witnessing from the Left, but because they are telegraphing their intentions. If protesters can provoke Trump supporters to be violent, they embarrass Trump and cast him as a fascist. And if the protesters themselves are violent, voters will understand that a Trump victory will be met with violent mob resistance. Nothing has changed since those days and in fact, the violence — Breitbart’s running tally indicates — is only escalating. The goal for the Left is to make America ungovernable, and again, they’ve telegraphed this intent. "Donald Trump’s regime is rapidly reconfiguring the United States into an authoritarian state. All forms of dissent will soon be criminalized. Civil liberties will no longer exist. Corporate exploitation, through the abolition of regulations and laws, will be unimpeded. Global warming will accelerate. A repugnant nationalism, amplified by government propaganda, will promote bigotry and racism. Hate crimes will explode. New wars will be launched or expanded." Not only have none of those predictions come true but few of them could have come true. Trump was elected president, not dictator; how can he transform the country into an authoritarian regime single-handedly? That’s not just absurd it’s paranoid. If anything, corporations have “exploited” the GOP-passed, Trump-signed tax reform legislation which has led to one record high after another on Wall Street — home to hedge fund millionaires and billionaires, true, but also to trillions of dollars in wealth held by average, ordinary Americans saving for their retirement. The Left continues its pursuit of violence and that violence becomes more and more prevalent as Trump’s administration proceeds. At some point, it becomes overwhelming and intolerable. Like, perhaps, after the 2018 midterms.